The L.R. Baggs Anthem SL is an exciting new development from L.R. Baggs that combines a very high quality, noise cancelling microphone with the famous Element undersaddle pickup. The endpin jack preamp is preset to blend the mic and pickup levels at the optimum amount, and also provides a preset crossover mix for both mic and pickup. The system includes a soundhole mounted volume control. For those of you who prefer a minimalist approach to controls, we offer the L.R. Baggs Anthem SL. In the Anthem SL the balance between the Tru-Mic and the Element pickup is preset for optimum performance so you can have the same great fidelity in an endpin preamp format. The preamp, with L.R. Baggs' famous all-descrete studio quality circuitry, is also equipped with as houndhole mounted volume control. After 30 years of effort L.R. Baggs has done the very thing that every amplified acoustic guitarist has dreamed about, and the very thing that no other pickup manufacturer has been capable of -- unlocking the potential of a microphone to capture the very essence of your guitar with high feedback resistance for demanding stages. Not obvious but equally important is that the natural ease and dynamics of the Anthem Tru-Mic liberates you to play freely without have to compensate for the pickup system. Now you are free to play the way you like, plugged in or not. For the Anthem we used no modeling, no illusions -- it's not "like" a mic, it's not "like" your guitar. This is a mic and what you will experience is your guitar, loud and with the fidelity and dynamics that only come from a real microphone. 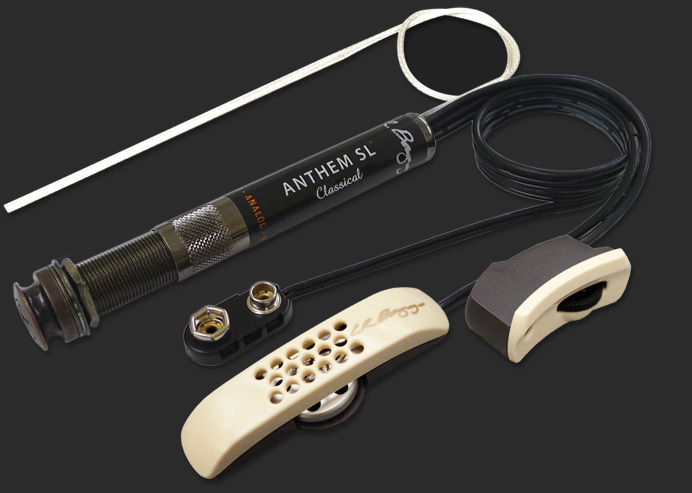 At the heart of the patent pending Anthem is a revolutionary new type of microphone. Utilizing a proprietary noise cancelling mic, the Anthem Tru-Mic elminiates any annoying honky or boxy qualities that have been previously associated with internal mic'ing, leaving the pure and natural sound of your guitar the way only a real mic is capable of doing. Because the mic is positioned within a few millimeters of the guitar top, it has very high gain before feedback. The mic housing mounts easily to the bridge plate and the mic capsule hovers just 3 mm above its surface to take advantage of the PZM or "boundary" effect. This Tru-Mic technology picks up the sound of the vibrations of the entire soundboard and makes the mic unusually free from placement issues. The sound quality and feedback resistance of the Anthem Tru-Mic now allows the mic to be the primary sound source in a mic/pickup system. This is unlike previous systems where only a small amount of the mic could be used to add some "air" to the dominant pickup signal. This is a radical new relationship between a mic and a pickup, as all of the detail, warmth and personality of your guitar is captured by the Tru-Mic. The mic is augmented, for only the very lowest frequencies, by the L.R. Baggs Element undersaddle pickup. Pickup active sensor length: 3.4"
Tru-Mic dimensions: 2.27" x 0.735" x 0.48"
B-Band UST 29R Replacement Undersaddle Pickup, 1/8"